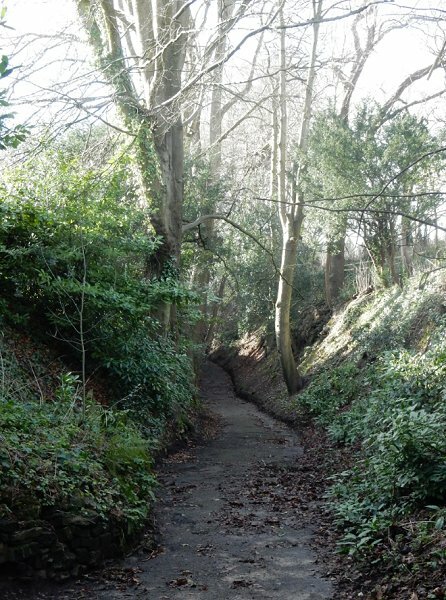 In the past Lovers' Lane, originally cutting off the corner between Hendford Hill and the Dorchester Road, has also been known as Crewkerne Hollow, the Old Holloway and simply Old Hollow. 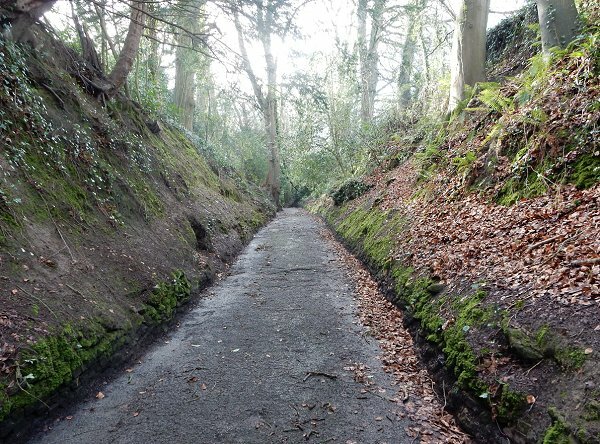 In fact it seems certain that the lower level of Lovers' Lane, together with Rustywell on the other side of Hendford Hill, followed the line of the old Ilchester to Dorchester Roman road as it ascended the hill. 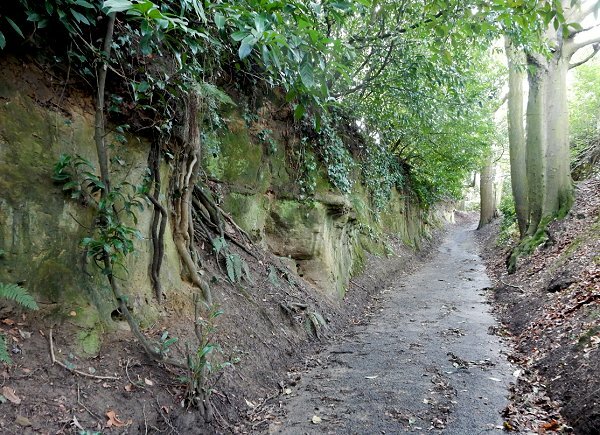 The upper end of Lovers' Lane, however, has a much more gruesome history. It is most likely that Corner Close, a field at the crossroads where Lovers' Lane met the Dorchester Road, was the site of burials of suicides, at least until the early nineteenth century. In its edition of 9 May 1814 the Sherborne Journal reported "A girl of the name of Sherstone, 20 years of age, servant to Mr Isaac Mullins, farmer of Yeovil (actually a glove manufacturer) put a period to her existence on Monday morning last, by taking a portion of arsenic; the Coroner's Jury sat on Saturday on the body, and brought in their verdict 'felo de se' (felon of himself). She was buried at the Cross Roads near the town. No cause is assigned for her committing this rash act, except a notice from her employer to quit his service for inattention to his afflicted mother." In 'Young Thomas Hardy' by Robert Gittings the story is recalled of a tale told to Thomas Hardy by his mother Jemima Hardy "She told him about a girl who had committed suicide, and whose burial she remembered as an event in her childhood. The girl was buried on Hendford Hill, near Yeovil, at a cross-roads on a bleak hill-top. Few followed to her unblessed grave. There was no coffin to carry her, and no wreath, though one other girl threw flowers on the exposed body. When it was put into the grave, a stake was driven through it, before the earth was heaped up over her, sloping up the sides of the stake like a prehistoric tumulus." 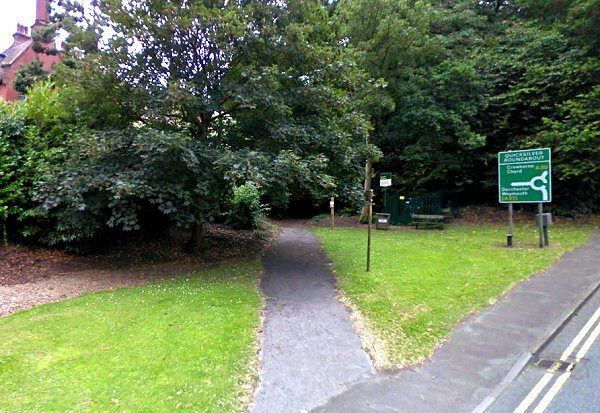 People who committed suicide were often buried at this crossroads at the top of Lovers' Lane. Another such place of interment was Noble's Nap. An Act of 4 George IV (1823) directed that for the future a felo de se may be buried in the unconsecrated portion of a churchyard between the hours of nine and twelve at night and expressly states "without any stake being driven through the body". The driving of a stake through the body of a felon or suicide, was to prevent the ghost from "rising to the face of the earth again." A Vestry meeting of 2 March 1855 agreed that "the Old Hollow, now being useless and unnecessary, should be stopped up". 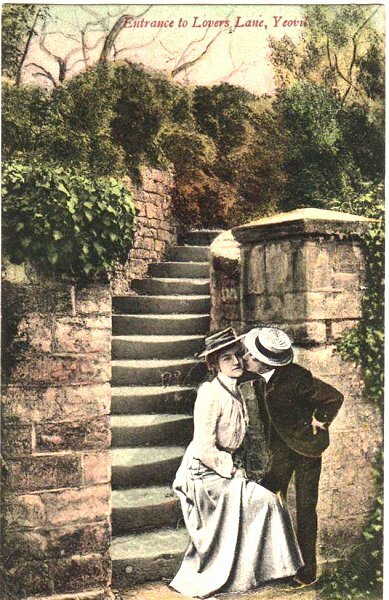 A charming postcard, dated 1906, showing the entrance to Lovers' Lane. 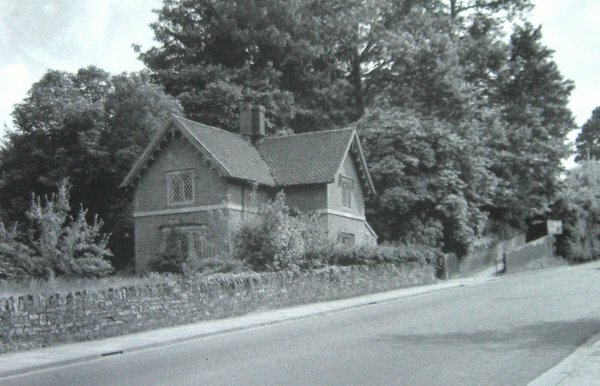 Swiss Cottage on Hendford Hill, probably photographed in the 1950s. 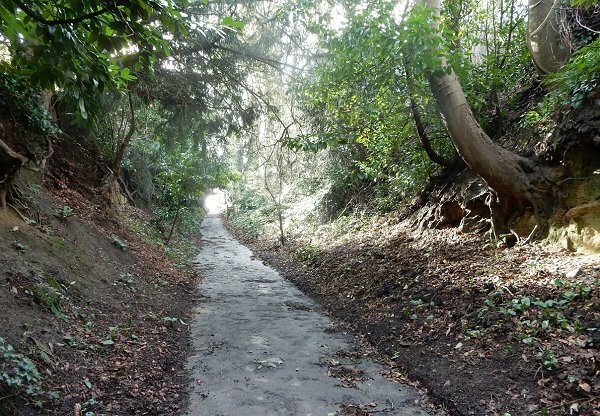 The entrance to Lover's Lane is seen at right. The entrance to Lovers' Lane in 2014. The lower end of Lover's Lane, near Hendford. Photographed in 2016. .... and just a little further along. Photographed in 2016. .... just over halfway up the hill. Photographed in 2016. The final stretch with Dorchester Road in view (albeit obscured by the bright light). Photographed in 2016.